As you’ve all probably guessed, I’m running low on blog ideas and the ones I’ve typed out just seem kind of “bleh” at the moment. So, since I get asked about Sam a lot, I’ll give you the Sam update. Sam is doing MUCH better. She’s regained complete control of her mouth and ears and her little face no longer droops. In fact, I’m pretty sure she’s over-compensating, because she now seems to smirk at us more (could be something we did). Sam’s eye, however, is a different story. Sam can close it (if we’re coming at her with artificial tears) but she cannot blink it. The closing is still a major improvement. Sam may never be able to blink again, but then again we were told her face might never return to normal, so we’re both thankful that she’s regained the control she has and hopeful that one day we’ll see more than just that third eyelid flash across her eye. For the most part, Sam’s life is pretty good. Her major obstacle are our two grumpy cats who try to cause her to implode by glaring at her. The cats are fairly sure they just haven’t got the right angle. When they’re not glaring, they’ll charge at her and much yelping ensues. Sam hasn’t quite put it together that she has about 20 lbs. on the cats and that her barking makes them nervous. Instead, she’s figured out that if she stands behind me and points at them, I’ll protect her. This makes for some fun times since Sam will not cross their path and they’ll occasionally block her from coming in the house, going into a room or down the hall. She’ll start whimpering, which is a signal for one of us to stand between her and whatever hellbeast doesn’t want her in their space (aka the house). So there you have it – Sam’s update. 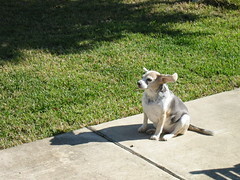 This entry was posted in Pets, Uncategorized and tagged beagles, Horner's Syndrome, Sam, Sam Update. I can fly mom, really I can…watch!